Item designs, both fixed and sizeable, may be designed with both vertical and horizontal orientations. 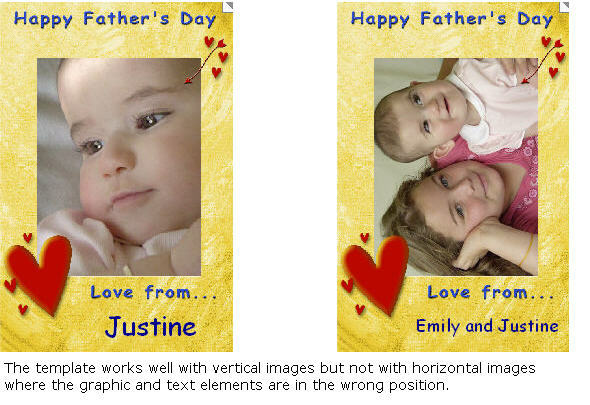 One use of this feature is when pack layouts require graphic and text elements to be placed in certain areas depending on the orientation of the original image. This is best explained by way of an example. Consider the following pack layout template complete with graphic elements and text boxes. The layout can only be used for vertical images as demonstrated below. There are two solutions available to the user. Make a completely separate layout for horizontal images. This approach is not recommended as it requires the use of two templates - one for vertical images and one for horizontal images. Whereas this may not be a concern for a user manually selecting images and ordering layouts it is not appropriate for any of the automated methods of ordering. The pack layout is generic in nature, containing only a single image hole which calls the required item design. The item design has both vertical and horizontal versions each with graphics, text and image elements in the correct orientation. The software will automatically use the correct version depending on whether a vertical or horizontal image has been selected. 1. In the template designer (Design Mode) start a new sizeable item. 2. Locate the Different Orientation Versions button and click it to activate the vertical and horizontal orientation buttons. 3. Select the vertical version by clicking the Vertical Version button. 1. In the template designer (Design Mode) start a new pack layout. 2. Change the canvas size to the desied size and place an image hole onto the canvas completely covering the canvas. 3. When the image hole properties window appears fill the image hole with an explicit item design. 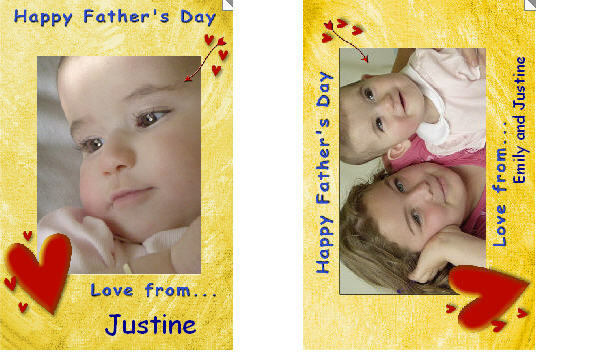 In our example the item design is fathers day. Use the pack layout template in the normal way. Whenever it is ordered the item design will be automatically applied to it. For vertical images the vertical version of the item design will be automatically applied. For horizontal images the horizontal version of the item design will be used.